Today I am back with the third installment of 'Four things I am using right now' sharing some of the things I am using every day right now. First up, and the priciest of the bunch is the By Terry Terrybly Densillis Concealer. I bought this for £44 from Space NK which is more than double than it's rivals the Urban Decay Naked Skin concealer which retails at £17.50 and the NARS Radiant Creamy Concealer at £22. The reason I choose these two as comparisons are that in essence they claim to all do the same-conceal, brighten and perfect and are all housed in a glass tube with doe foot applicator. Next up is the Balancing Lime Blossom Cleanser from Elemis. I have a deep love for the Elemis Tri-Enzyme Resurfacing Face Wash and have been through bottles of it. The Tri-Enzyme cleanser contains glycolic acid (AHA) but this one is a much gentler, non chemical exfoliant cleanser. Aqua/Water/Eau, Helianthus Annuus (Sunflower) Seed Oil, Glycerin, Isopropyl Myristate, Lauryl Glucoside, Polyglyceryl-2 Dipolyhydroxystearate, Phenoxyethanol, Lecithin, Carbomer, Xanthan Gum, Acrylates/C10 – 30 alkyl Acrylate Crosspolymer, Fragrance (Parfum), Chlorphenesin, Disodium EDTA, Sodium Hydroxide, Tilia Cordata (Linden) Flower Extract, Citric Acid, Tocopherol, Maltodextrin, Caramel, Potassium Sorbate, Sodium Benzoate, Chlorophyllin-Copper Complex, Potassium Hydroxide, Amyl Cinnamal, Cinnamyl Alcohol, Citronellol, Geraniol, Hexyl Cinnamal, Hydroxycitronellal, Butylphenyl Methylpropional, Limonene, Linalool, Alpha-Isomethyl Ionone. 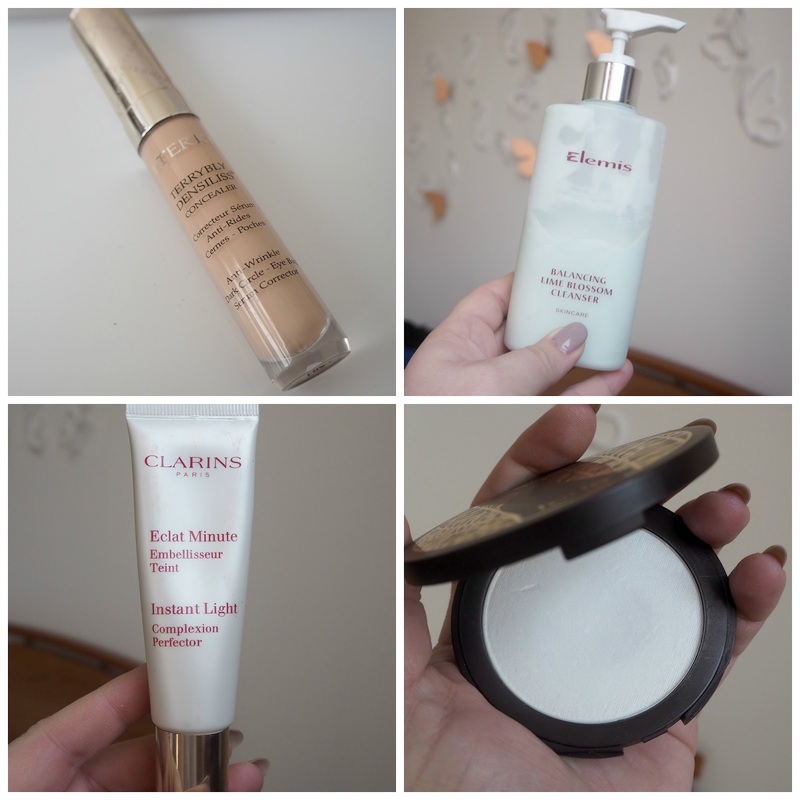 The Clarins Instant Light Complexion Perfector is a bit of an odd product. This is the shade 01 Rose Shimmer which is the palest shade in the range of 6. Clarins describe this as a gliding, lightweight, fluid texture instantly melts into the skin to leave the complexion smooth and even. Imperceptible on the skin, it illuminates the complexion which stays flawless and satin-smooth in any lighting. It fixes make-up, giving a natural, long-lasting result. I read from that it's a foundation primer which I have been using it as. But I am not sure I am wowed. It has quite a heavy texture and feels quite silicony on the skin. I have been all about the glow recently but I don't get an obvious 'impact' of glow on my skin. Foundation does sit nicely on the top of it and skin feels hydrated and plumped. I also have 03 Bronze Shimmer and this is my all time favourite product for mixing with foundation to darken it when I have a tan (on the very rare occasion!) It mixes well with every foundation I have tried it with and its a holy grail product for me. But I have just found out it's discontinued!!! By the way, despite the names, neither contain any shimmer in them at all! Lastly the Tarte Smooth Operator Amazonian Clay Pressed Finishing Powder is the powder I am carrying around in my handbag make up bag right now. This is a white setting powder in a pressed form, similar to the Make Up For Ever HD Pressed Powder I talked about in this Disappointing Products post. I much prefer the Tarte version although I still feel it is still quite a loose texture and I need to be careful not to get covered in 'setting powder dandruff'-especially when touching up in the office and wearing my default black. But it doesn't leave a white cast on the skin and it does a decent job of controlling oil-I like it-but it is a bit pricey at $35. I'm still a massive fan of the Charlotte Tilbury Airbrush Flawless Finish powder and I just can't find anything better!